Drivero is a car sharing platform whose objective is to provide a car when you need it, where you need it. It’s a car for which you pay when you use it. When you wish to meet friends that you haven’t seen in a while or just to go from point a to point b. It’s a car that’s shared across all drivero users. We are happy to offer the best market price aswell as new, clean and working cars. Did you ever wish to drive a Porsche with the roof down, enjoying the good weather? Or maybe you like the sound of the BMW F10 M5’s engine? Our team will be honored to offer various class cars, starting with simple city cars, ending with business or sports classes. 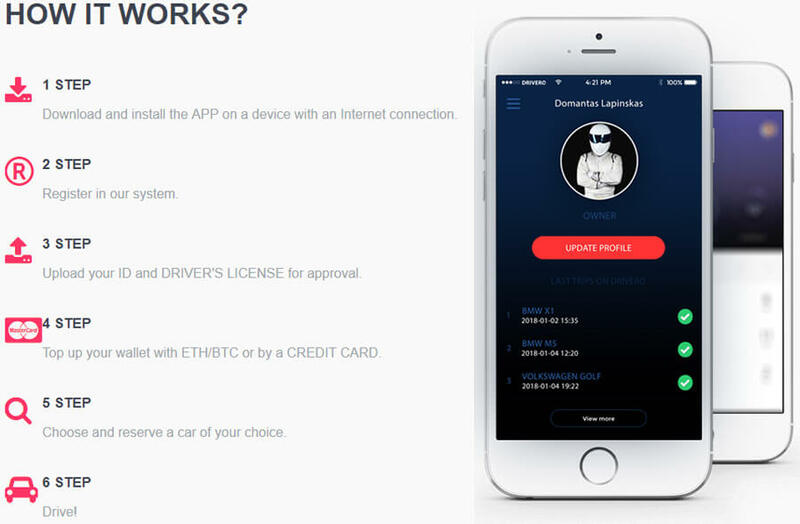 This platform will give every DRIVERO user the ability to rent their own car to others. We will take care of your cars safety by installing safety equipment. You won’t have to worry fuel, insurance or maintenance expenses. Everything is a part of the rent price..Parking included too. In order to protect and ensure high transfer speed for the data, we will use BLOCKCHAIN technology. Since technology is moving forward, we wish to do so aswell. That’s why you’ll be able to pay using ETH/BTC or with a Credit or Debit Card. PLATFORM LAUNCH (GERMANY).PARTNERSHIP WITH GAS STATION.